Pilgrim's Progress Today: Is Christian America Humpty Dumpty? Is Christian America Humpty Dumpty? I've been trying to grasp the reality of what's happening to Christian America now that the Supreme Court legalized gay marriage. In this process, I started listing in my mind all of the changes in our culture in the last fifty years such as legalized abortion, legalized marijuana, unquestioned acceptance of global warming, the breakdown of the traditional family structure and cultural hostility toward Christianity. I tried to figure out what the devil happened to the United States. During my musings the nursery rhyme went through my head (my thoughts aren't always well-focused). 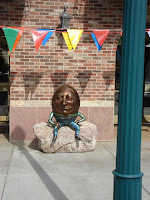 Then as musings often develop, I started equating Humpty Dumpty to the United States. For many years the United States sat content and securely on the wall. It viewed itself as the richest and most powerful nation in the world. It believed it had the highest standard of living in history, was a noble country that righted wrongs globally and thought of itself as an example for all nations to emulate. It's great prosperity after World War II led to a degree of self-indulgence and arrogance. This was mixed with social hypocrisy based on materialism, social status seeking and racism that was irreconcilable to it's self-professed noble social values. This caused the children of that generation to be spoiled as well as critical and rebellious against the established social values. The coddling of the children led to the rise of the "love generation" and the continuous growth of self-indulgent social values and social policies. The younger generation's reaction to existing social values and racism led to the beginning of the Great Society and the government social programs that ruined the nation's great economy. This resulted in the older generation and the new generation that wanted to preserve the traditional values to try to get "their country back". However, when Humpty Dumpty fell of the wall, he was no longer a pure egg but an omelet. The omelet included additional liberal ingredients including values from other ethnic groups, abortion rights, gay rights and expensive social policies that had become a permanent part of the egg. All the king's horses (conservative political parties) and all the king's men (the Christian community) couldn't put Humpty together again. There is no way you can take an omelet, remove its additional ingredients, reconstitute it pure egg white and pure yolk, restore the cracked egg shell and put it together again. The best the king's horses and king's men could hope for is remove the liberal ingredients from the omelet and replace it with their preferred conservative ingredients. However, the longer the liberal ingredients saturate the omelet the more impossible it is to remove. Do you have any ideas of how to fix this troublesome omelet? Give me your thoughts.